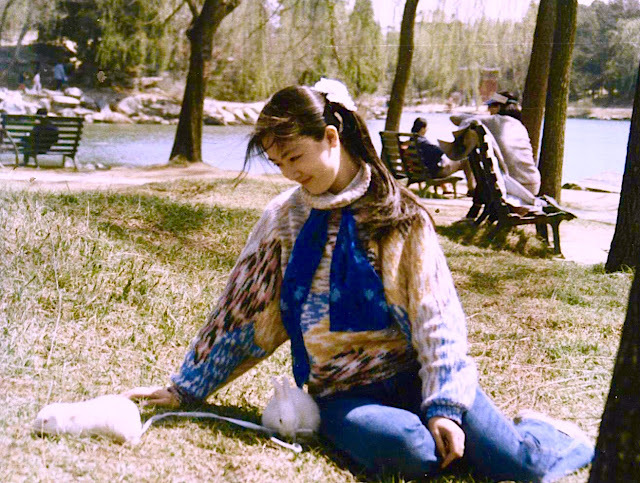 Enjoying a sunny afternoon beside the Unnamed Lake of Peking University with my two pet rabbits. How did I manage to keep them from running away? Just tied them together. They did try very hard to run away; but as they always ran to different directions, so they ended up going nowhere, haha. By the way, the sweater I was wearing was designed and hand kitted by myself. I fell in love with kitting sweaters during the last six months in my university, when we had virtually no classes as everyone was preparing for the entrance examination for graduate school. I didn''t need to sit the examinations as I had already been admitted by the graduate school of Peking University without examinations due to my VERY outstanding academic performance. Only two students had this honor. However, ten years later, I was sent to the Beijing Female Labor Camp for practicing Falun Gong. Apart from being shocked by electric batons, kicked and beaten up by the police and other criminals, we were also forced to hand kit all sorts of sweaters which were to be exported to foreign countries. The work load was so heavy that I even dared not wash my hands after using toilet as I couldn’t afford to waste even one minute on hand washing. If you have ever bought a hand kitted sweaters made in China, they might have probably been kitted by people like me with blood and tears; and without any payment! Anyway, after being released from the labor camp, I would never, ever, hand kit any sweaters. Click here for info about where to read or buy Jennifer''s book in English and Chinese, as well as where to watch award winning documentary based on Jennifer''s story: "Free China: The Courage to Believe"